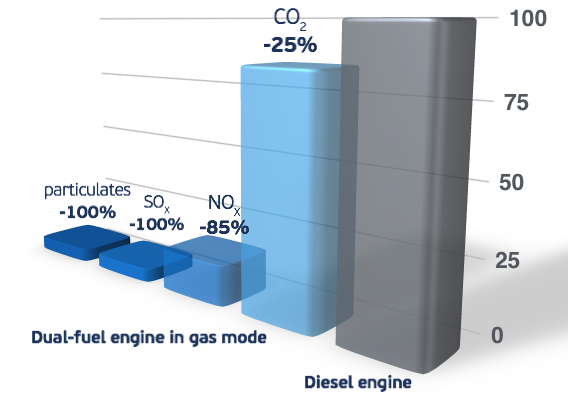 Low Sulphur FuelOil (LSFO) – LSFuelOil <0.5%. As an upstream solution, the Sulphur content is taken care of at the source. Refining capacity, cost and worldwide availability are the main concerns. Distillate Fuel Oil – Marine GasOil (MGO) and Marine Diesel Oil (MDO). Are low Sulphur oils used in many vessels. Distillates may be direct replacement option of FO but the cost and product availability are to be considered. Exhaust Gas Cleaning Systems – Scrubbers. In this case vessels may continue to burn High Sulphur FO (HSFO) using a recent technology, not tested throughout a long period of time, that is fitted in the exhaust of the vessel. Installation cost, space requirement, equipment weight and maintenance are obstacles to examine. Alternative Energy Sources –Biodiesel, solar and wind power and methanol. Are still to be explored through research and development. The most environmental friendly and cost effective alternative energy source is LNG. This is why the use of LNG as a fuel has increased significantly over the recent years. 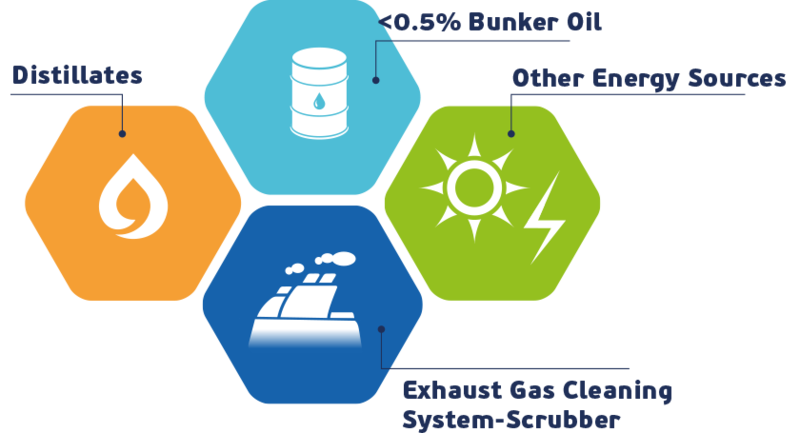 LNG has significant environmental, financial and safety advantages over alternative marine fuelling options. LNG is the most economic option amongst marine fuels. Advance extraction methods and Innovation have led to the discovery of new natural gas reserves that increase the available product in the market. The large supply of natural gas will continue to maintain lower gas prices than conventional fuels and even increase the spread between competitive prices in favour of LNG, especially with the decoupling from oil prices. Since the introduction of LNG as a marine fuel and the associated LNG bunkering operations, the industry has an exemplary safety track record.